I recommend Ron Carlson's fine example text at left. A worn-out copy should be in the library of everyone looking to craft a short story without writing to an outline. At the conference I just attended, nearly everyone in my session wrote without an outline. I guess I too wrote for a good twenty years without outlines. Of course, that got me a great pile of unfinished stories - sometimes because I was too lazy to finish or because I had written myself into a wall. Professor Carlson's text at left provides a solid tactical approach to the sort of inventory-based writing (seat-of-the-pants) we've all done at one time or another. The fresh drafts come from this sort of writing. It's good to turn to some familiar things for a grounding when confidence lags. For me, it is a fine tinned tobacco called Squadron Leader. I knew a fellow whose woodshop and library smelled of this. It wasn't his brand; but, his library smelled of it anyway. When I have a bowl, I'm taken right back to those days when literature held a special fascination before any of the machinations and devices seemed jaded. I loved discovering every turn and trick. That sort of memory device brings us back to a place where we were comfortable and comfort is very very close to confidence. You can walk to one from the other late at night with no worry. I'm plotting. I have a trio of stories - two stories and a novella, actually. I'm going to start with these and before I am done with the drafts and re-writes, I bet I have a couple more stories and another novella. The characters are intermixed and the settings are geographically the same. I'm not sure I ready to live with six months of novel right now so I'm going to work on this collection of bits. I just decided to attack this project today. It seemed like a good time. Look what the familiar and a little confidence will do. I hope your coherence returns if it ever left. Mine needed a little roadmap to find its way back to a substantial project. The signpost was confidence. I hope you're writing. 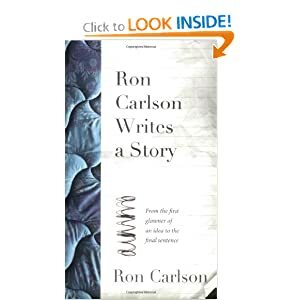 Give Ron Carlson a read. Books ? What do you mean Books? Normal Families Eat Toast for Breakfast.